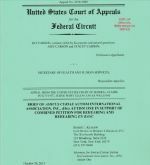 BRIEF OF AMICUS CURIAE, AUTISM INTERNATIONAL ASSOCIATION, INC., d/b/a AUTISM ONE, IN SUPPORT OF COMBINED PETITION FOR REHEARING AND REHEARING EN BANC in the case of KIT CARSON. (Authors: Robert Krakow, Esq., Susan Lee, and Helen Sturm). Imitation by James W. Partington, PhD, BCBA-D, et al.